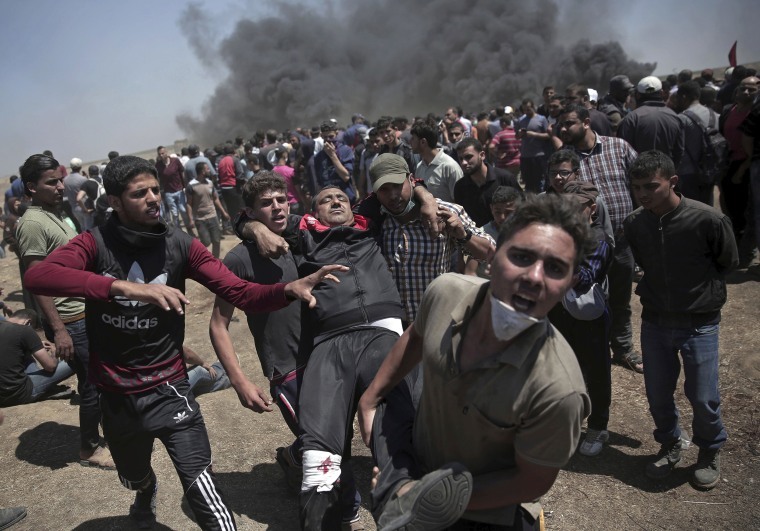 Israeli troops killed dozens of Palestinians protesting along the Gaza boundary as the U.S. opened its embassy in Jerusalem. 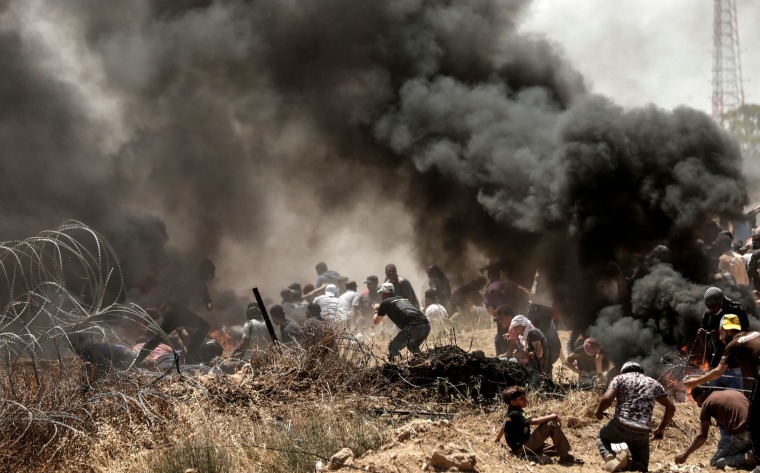 Palestinians clash with Israeli forces near the border between the Gaza strip and Israel, east of Gaza City, on May 14, 2018. 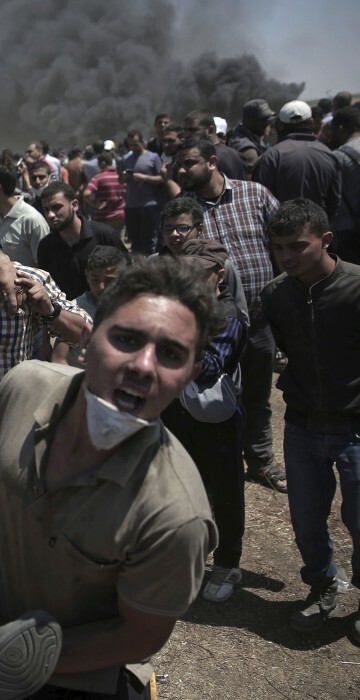 Palestinian protesters carry an injured man who was shot by Israeli troops east of Khan Younis, Gaza Strip. 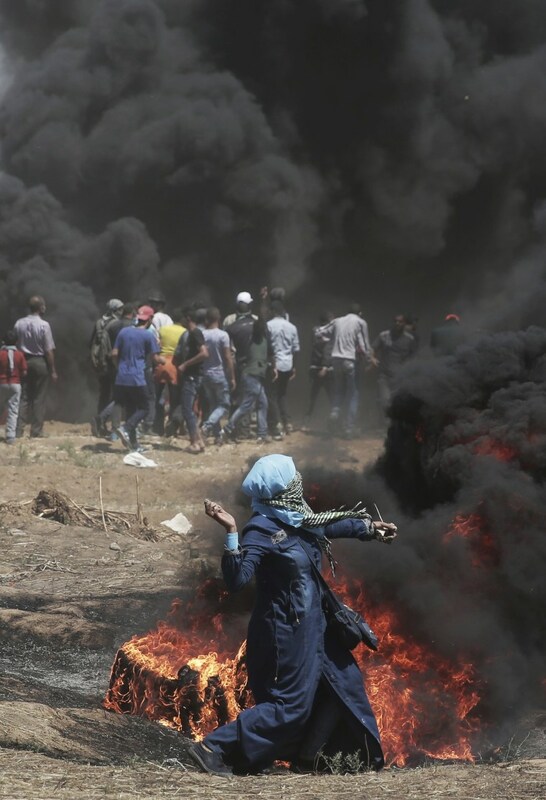 A Palestinian woman hurls stones towards Israeli troops. An elderly Palestinian man falls on the ground after being shot at by Israeli troops. Palestinians carry an injured demonstrator. 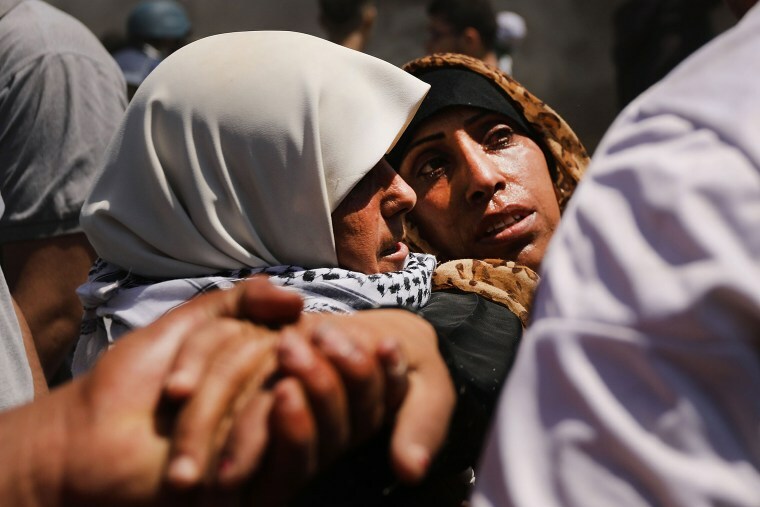 A wounded Palestinian woman is carried away. A protester launches a stone. The Israeli military said the demonstration involved 35,000 people "taking part in violent riots" at 12 locations along the barrier. The Palestinians are demanding what they refer to as their “right of return” — that Israel allow the return of millions of Palestinians whose families left or were forcibly removed from Israel at its founding in 1948. 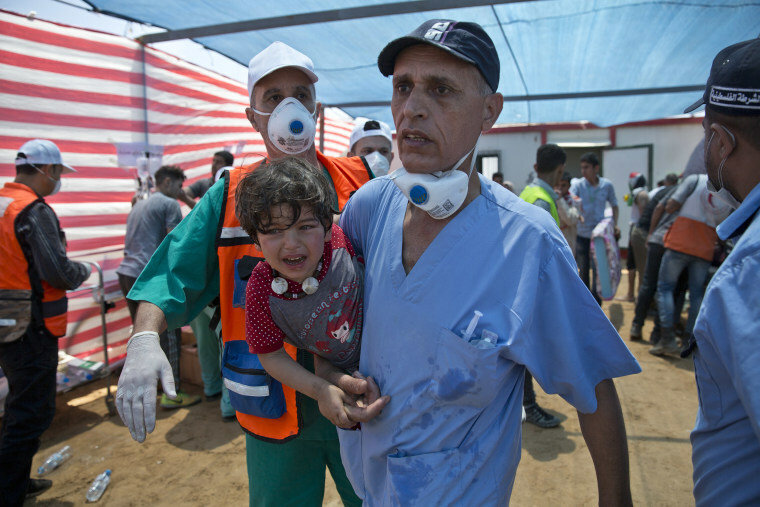 A child overcome by tear gas is rushed to medics. An Israeli drone drops tear gas canisters on Palestinian protesters. Palestinians run for cover from tear gas. 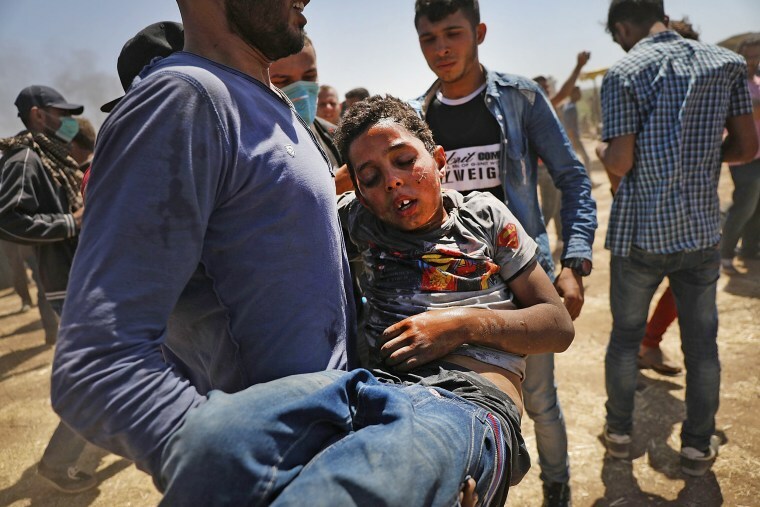 The brother of Shaher al-Madhoon, who was killed during a protest at the Israel-Gaza border, holds his body at a hospital morgue in the northern Gaza Strip. Israeli soldiers take up positions on their side of the border. Monday's march was meant to express anger over U.S. Embassy's inauguration, while Tuesday will mark "Nakba" or Catastrophe Day, when Palestinians observe the 70th anniversary of Israel’s founding. A medic carries a Palestinian child suffering from tear gas inhalation during a protest near Beit Lahiya, Gaza Strip. 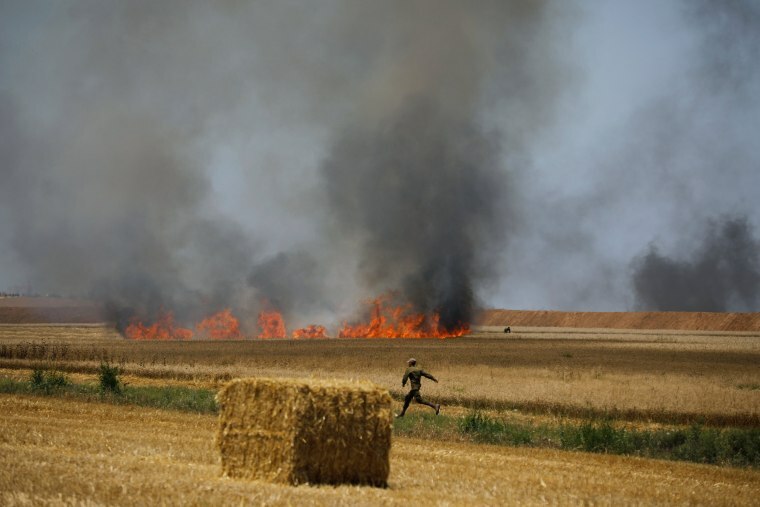 An Israeli soldier runs through a field that caught fire close to the Israeli side of the border fence, near kibbutz Mefalsim. 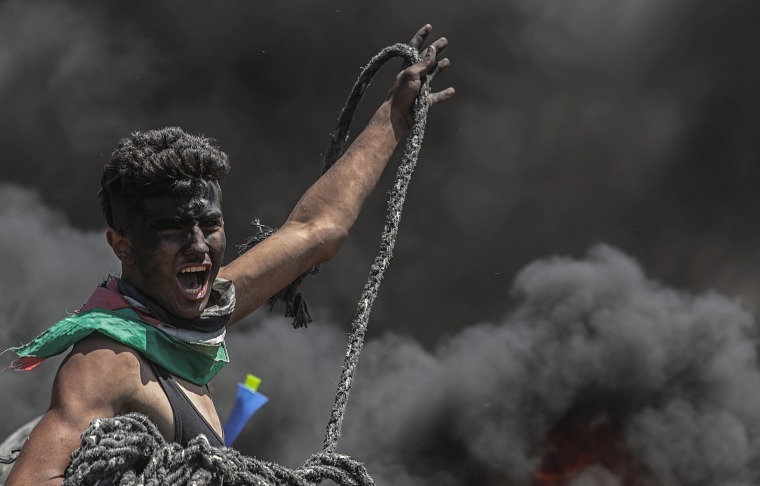 A demonstrator waves the Palestinian flag as he walks through smoke billowing from burning tires. A Palestinian protester holds a rope during clashes. President Donald Trump's recognition in December of Jerusalem as Israel's capital outraged Palestinians, who said the United States could no longer serve as an honest broker in any peace process with Israel. A Palestinian woman sniffs a fragrance to counter the effects of tear gas. 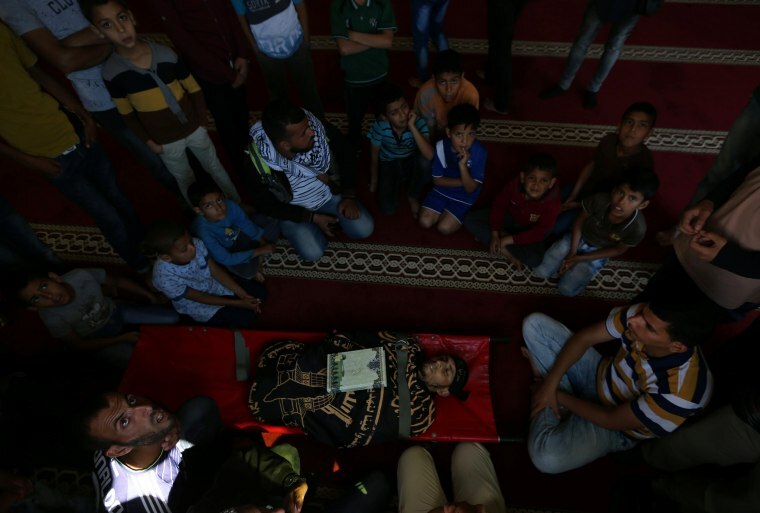 People gather around the body of a Palestinian, who was killed during a protest, at his funeral at a mosque in Khan Younis in the southern Gaza Strip.